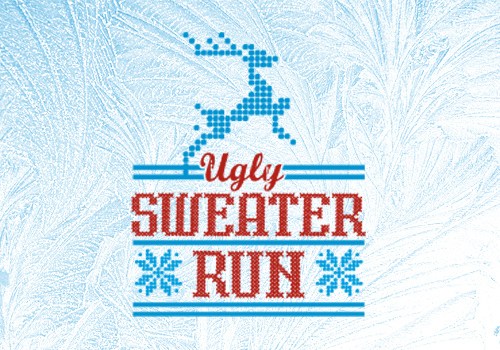 All the permits have been submitted, so we are happy to announce that our 2nd Annual UGLY SWEATER 5K Fun Run is scheduled for Saturday, December 17th! With our toy drive from this event last year, we were able to brighten the holidays for many of our area youth, so we will continue the tradition with this year’s event. Since registration for this event is FREE, we kindly ask that you bring an unwrapped toy to donate as your participation ‘fee’. Let’s see how full the we can make our tree this year!! Who doesn’t love a great UGLY SWEATER? Even if you don’t currently have one hiding in the depths of your closet, we can bet you know where to find one, or can make one! This event garnered our largest turnout for any of our 5K’s in the series last year, so the question is….can we top it this year? Tell your friends, bring your family, but make sure you join us for this EPIC event! PRIZES will be awarded to the Ugliest Sweater in addition to our race winners! Our 5K series is designed to be FUN! With that in mind, all of our races are prediction races. That means we ask you to GUESS your finish time before you start. Those that come the closest to their actual time (within 10 seconds) will be declared the WINNERS!! Since parking is limited here at the store, we ask that you plan to park at St. Michaels Elementary School, then make the short, 2-block walk to the shop on race morning. On-site registration and bib pick-up will begin at 7:30am. We will have a brief pre-race meeting in our front parking lot at 8:45am, then cross the street together to the race start line. The race will begin at 9:00am. We will have one water station set up on the course, which is passed twice. All ages and abilities are welcome to participate in this event. Runners, walkers, joggers, walk/jog, child strollers and 4-legged friends….all are welcome! Remember that if you don’t want to walk or run, then we could always use an extra hand or two as a race volunteer!! We hope to see you on December 17th dressed in your ugliest gear!! Please note: We are awaiting approval from the town, so stay tuned for any possible changes in the coming weeks.